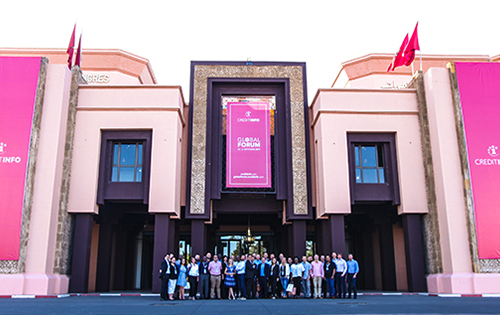 If the Creditinfo Global Forum 2017 that happened in Marrakech, Morocco on 19-21 September, was to be described in one sentence, only a metaphor could help. It was a huge melting pot full of fresh ideas, game-changing innovations, big personalities, practical classic solutions and spicy opinions, all enriched thanks to the multiplicity of cultures. More than 250 top-level conference participants, all together and in the best of moods, were working towards the same goal regardless of the continent they represent: a higher and ever increasing level of financial inclusion. This global conference was a third international bi-annual event by Creditinfo and the largest top-level industry reunion so far, counting 250+ attendees, ±50 nationalities and more than 25 renowned speakers from all around the world. Several themes of actuality were covered, such as “Lendng Industry Trends”, “Innovation in Banking”, “Innovations in Fintech”, “Cybersecurity”, “Financial Inclusion”, “Scoring Developments”, “Legal Industry Outlook”, etc. Amongst interesting facts, the “Innovations in Banking” section topics were almost exclusively covered by women speakers, while lending industry trends from the consumer perspective were presented by a duo of speakers representing generation Z. More facts about industry trends and highlights from the Global Forum will be presented in the next Creditinfo Trend Report, coming out this Autumn, therefore stay tuned!